Bem fora do seu cotidiano. Ha ha ha… I love this simple look at years past, emphasised by this very original red line. Why? No reason possibly. Or the reason escapes me. But why should there be a reason after all? 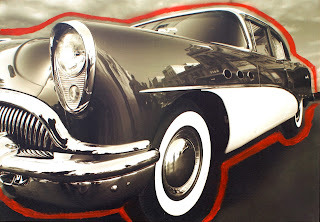 BTW, this is a Buick 1954. Yessir. I am an old guy now, and I remember when I was 10 or 11, collecting pictures of cars in magazines and newspapers. This Buick was one of my favourites. bela imagem, provoca inúmeras impressões, afinal a arte é pura emoção. Tenha um 2013 repleto de inspirações.